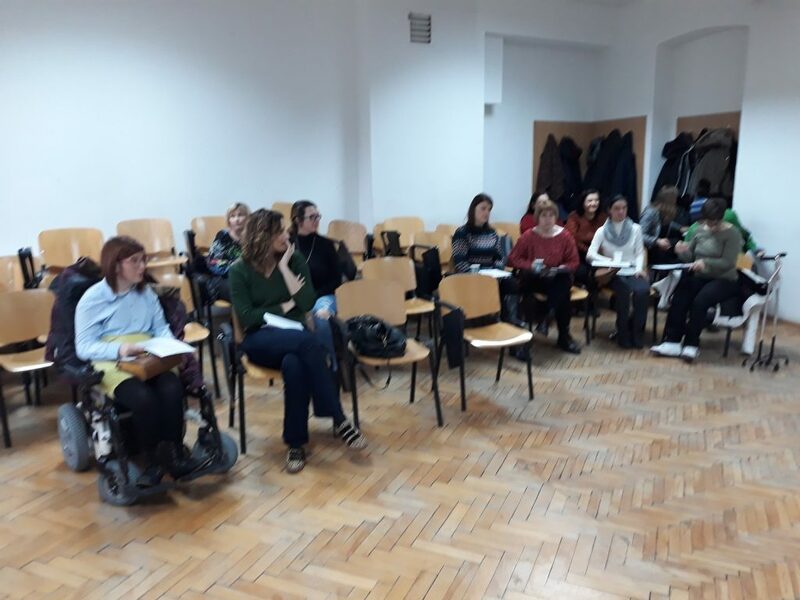 Round table on self-employment of persons with disability held place at Study Centre for Social Work at Law Faculty of Zagreb University on 28 January 2019. Round table is organized by students of Social Work, who are taking part in project “Service learning for inclusive community organization”, which RCT is implementing in partnership with Law Faculty – Study Centre for Social Work of Zagreb University. Ivana Mikek Kupres and Marijana Senjak from Croatian Employment Service presented on self-employment opportunities and subsidies for persons with disability and Natalija Krajinović from Ombudsperson for Persons with Disability Office spoke about legal framework and protection against discrimination regarding employment and work. Albina Žnidar and Maria Tomić Preiner, both persons with disability, presented on their own self-employment experience and entrepreneurship of persons with disability. This round table is a part of the advocacy campaign students of Social Work students, and it is a result of the research findings, following monitoring and evaluation researches of policies with regards to persons with disabilities they carried out as a part of academic service learning.